Modern Classic Jewelry - This is a medium width handcrafted sterling silver tapered slip-on airy bracelet features an oval green and blue Azurite cabochon. wear. 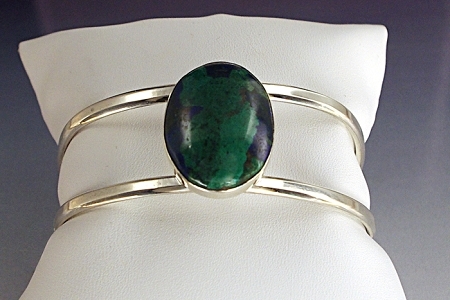 The bangle is designed to fit somewhat snug on the wrist to avoid the bracelet from turning. This is a beautifully simple and elegant Sterling Silver cuff style bracelet that is hand-formed. 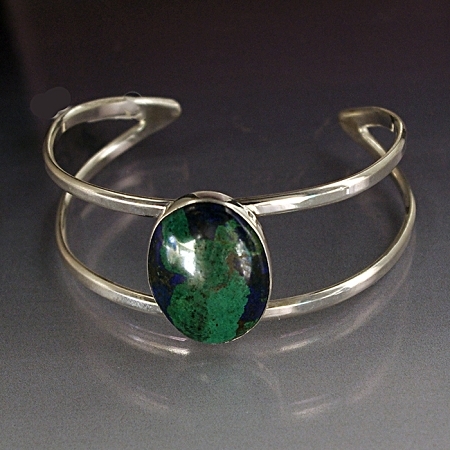 The limited edition airy bracelet is a nice complement to the oval azurite cabochon that is fully bezeled. 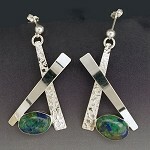 Every cabochon is unique and will be close in color as pictured.The cuff bracelet is designed to fit somewhat snug on the wrist or arm to avoid the bracelet from turning. This bracelet is handmade in our studio and may vary slightly, but our attention to detail ensures that you are wearing a one of a kind high quality bracelet. This is a truly unique piece that is designed, handcrafted, and signed by Aaron Rubinstein and Modern Art Jewelry. This Bracelet is .82" wide in the front and tapers to a dull point in the back. The Azurite cabochon is approximately 1" long x .74" wide (25 mm x 18 mm).